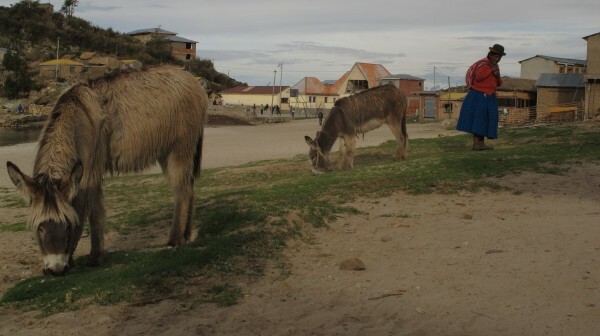 Before departing Bolivia, we had one last stop to make: the town of Copacabana on the shores of Lake Titicaca. The lake is widely regarded as the largest high altitude lake in the world. Covering an area of nearly 8500 square kilometers and at an altitude of over 3800 meters, it is both massive and really high up there. When arriving in Copacabana, Christine was immediately repulsed by the distinct “touristy” feel. Restaurants with outdoor patios lined the shores, which were nice, but the dozens of paddle boats available for rent were not. Regardless, we found a cheap-but-nice place to stay, with a wonderfully helpful older local lady (dressed in the traditional colorful garb and bowler hat). 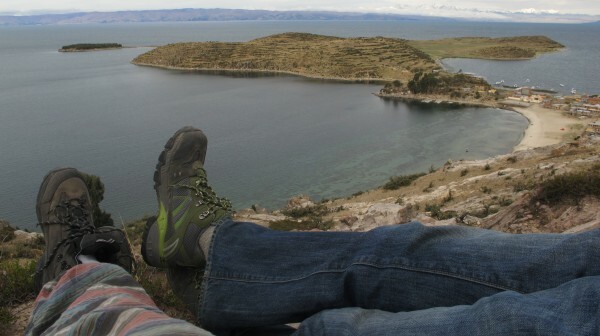 The next day we purchased tickets to the nearby Isla del Sol, a large island about two hours away by boat. On a recommendation, we went to the northern side of the island, intending to hike the five or so hours to the southern port. We had thought about camping on the island, but the logistics of lugging around all the necessary gear did not make a whole lot of sense. Instead, we stayed in the first hostel we came across after arriving. The place was clearly under construction, with only two rooms available at the moment. However, the room he showed us was first rate and far nicer than we had expected to find on this outpost of civilization. I imagined that the hotel owner had a dream for this hotel, much like in the excellent film Best Exotic Marigold Hotel, and we were contributing in a small way. Before sunset, we ventured around the island a bit, climbed a small hill, or rather, climbed part of the way up a big hill, and took in the sights. The water was a deep shade of blue, in stark contrast to the pale brown dirt of the island. In the distance, snow-capped mountains stood majestically against the darkening sky. The sign outside our hotel promised hot water and a great sunrise, but it only managed to deliver on the latter. I would like to report that we were energized by the phenomenal sunrise, and hit the trail bright and early, but instead we decided to go back to bed for a few more hours of sleep. Our hike began in earnest around 10 o’clock. We hoped that we would be early enough to stay ahead of the day hikers who would begin arriving on our end of the island within the hour. Those hopes would be dashed by eleven, before we had even reached the first set if ruins, when a couple of familiar faces strolled down the path. Me with our Dutch friends, Robert and Ninka. The backpacker circuit can be a small world, and we were still pleasantly surprised to see Robert and Ninka, the Dutch couple from our salt flat tour again. Despite being from a country that sits below sea level, they were having no problems with the altitude. Robert and Ninka seem to be the type of people who were built for hiking; both are several inches taller than me, and they absolutely tower over poor Christine. We tried to keep pace with their long strides, but they soon began to pull away from us. 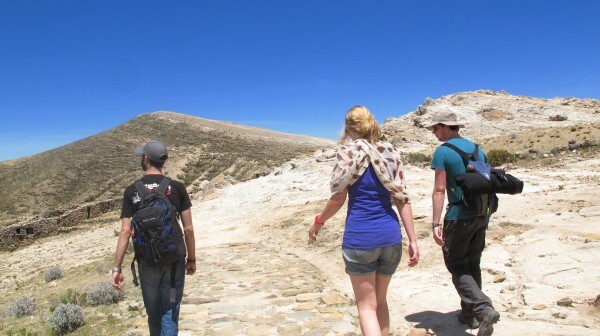 The hike should not have been too strenuous, but the altitude, over 4000 meters at points, was difficult to deal with. We had hoped that the two weeks spent at altitude would have allowed our bodies to adjust, but this was clearly not the case. Thankfully, the trail was mostly empty, spare for the random checkpoints along the way, each one featuring a local lady selling a new ticket for the pleasure of continuing our hike. The height of this absurdity–both literally and figuratively–came exactly halfway through the hike on the island’s tallest peak, leaving us no choice but to pay the fee. By the time we reached the end of the trail, we had exhausted the small amount of pocket change we had carried with us on the hike, and yet there was one last fee for leaving the trail. The man was asking for ten bolivianos for the two of us; all I had was a 100 bolivianos note. He had no change, so in a huff, Christine and I just pushed our way past him. After successfully avoiding the last toll, Christine noted that this should have been our strategy all along. Between the random and obligatory contributions to the Bolivian economy, we were treated to some great views. However, the most spectactular sight came when we approached a woman leading a small herd (if that is the right word) of donkeys. One by one, the donkeys moved over to the side of the path, making way for us to pass. Polite donkeys! Now we’ve seen everything. Once we reached the small port at the southern end of the island, we found Robert and Ninka waiting for the boat back to Copacabana at a lakeside restaurant. In the three hours since we had last seen them, they managed to complete the trail a full thirty minutes faster than us. 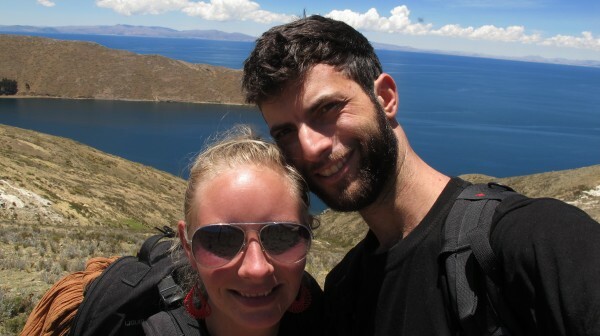 When we arrived back in Copacabana, we found another salt flat alum, Gemma, the guitar-toting Brit, and Bas, another Dutchman from our trip down the Death Road, drinking at one of the aforementioned restaurants lining the shore of Lake Titicaca. As I said, the backpacker circuit is surprisingly small. We bought a couple rounds of beer for our travel companions, ate some dinner, and enjoyed another brilliant sunset. Sometimes, being a tourist isn’t so bad.